(December 04, 2013) Enjoy the Music.TV is now accepting submissions from those within the music industry to have their video featured on our channel. We will be delivering to our enthusiastic worldwide audience high quality videos from manufacturers, recording studios, musicians, DJs, etc. so the world can share in your joy of music! Find out more about this great opportunity by sending us an e-mail for more details. Soon we will be holding a contest for viewers to submit their videos, with the winner being chosen by our audience. More on this in the coming weeks. 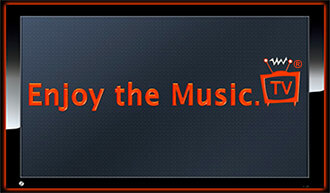 Enjoy the Music.com is the only specialty audio site with its own Internet browser, RSS feed, Android and Windows Phone 7 / Windows 8 applications so their readership can easily find information they desire. Music enthusiasts can find us on all leading social media sites including Facebook, Pinterest and Twitter. Enjoy the Music.com is official Internet partners with The Absolute Sound, Australian Hi-Fi Magazine, CANADA HiFi, Hi-Fi+, Hi-Fi Media, Hi-Fi World, HIFICRITIC, and legacy publications Sound Practices and VALVE magazine. Enjoy the Music.TV adds Internet partners Audio360.org, Dagogo, High-Fidelity, High Fidelity PL, Mono & Stereo, Part-Time Audiophile, and Positive Feedback Online.